If you are a visitor to the historic New England state of Massachusetts, plan a ghost-hunting adventure and stay at one of Massachusetts' haunted hotels. And if you are a resident of Massachusetts, get to know your state's spookier side and embark on an exploration of the unexplainable and visit one of Massachusetts' very own haunted hotels. One of its most haunted hotel is the Lizzie Borden Bed and Breakfast in Fall River, that is home to the legendary Lizzie Borden. August 4th, 1892, legend has it that youngest daughter, Lizzie Borden took an axe and murdered her father and step-mother. Though tried and acquitted, Lizzie was ostracized from the community of Fall River. 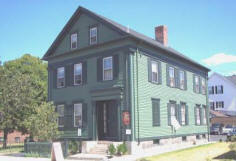 The Lizzie Borden Inn is thpe actual home where this murder took place. The home remained a private residence, but now it is open as a B&B – so not only can you see the rooms where the murders took place, you can actually spend a spooky night in them! This is spooky/ghost-lovers dream! The proprietors even serve their guests a breakfast similar to the one the Bordens ate on the morning of the murders, which includes bananas, jonny-cakes, sugar cookies and coffee in the addition to a delicious meal of breakfast staples! There has been some unusual ghostly experiences at the inn. Body impressions appearing on newly made beds and mysterious fog or smoke in the parlor are about the extent of it though – sorry, no sightings of any Bordens’ ghosts. When you first think of Salem you automatically think of witches. Salem is indeed affectionately referred to as “Witch City.” Heck, this is the place to visit if you are bent on witch lore. But it wouldn’t be complete without a few ghosts too, right? And the Salem hotel to stay at to experience some paranormal activity is the Hawthorne Hotel. Named after American author and Salemite, Nathaniel Hawthorne, the Hawthorne was built in 1925. But enough of the brief history lesson. You just want to know about the ghosts of course! According to the hotel’s general manager, the most prominent paranormal activities involve the “phantom hands in room 325” and the spectral woman on the sixth floor. There are swarms of stories about bathroom lights and plumbing going on by themselves in room 325, as well as the sound of a child crying and the sensation of hands touching guests. There are also a few very cool things about staying at the Hawthorne. First and foremost…..episodes of Bewitched were actually filmed there! And secondly, this hotel uses Salem’s witchy history as a source of fun. Each year they throw a Halloween party extravaganza for their guests. Part of the package includes a three night stay, two tickets to their Annual Costume Party and a VIP goodie gift bag.